To keep friends, it’s best to stay away from the subjects of politics and religion. On these two subjects everyone has their mind made up and they are always right. I’ve had relatives and good friends look me straight in the eye and tell me I’m going to hell because I didn’t belong to their church. It’s sure hard to remain friendly after that but I have done so. I decided long ago to try my best to keep and open mind about most things in life, but it’s difficult when you are dealing with fanatics and minds controlled by emotion rather than logic. I will just follow in the footsteps of my hero Mark Twain and remain a comic critic of everything; Democrats, Republicans, Communist, Socialist, Christians, Jews, Muslims, Atheist, Thieves and the like. Here is what my hero Mark Twain had to say about it: “In religion and politics people's beliefs and convictions are in almost every case gotten at second-hand, and without examination, from authorities who have not themselves examined the questions at issue but have taken them at second-hand from other non-examiners, whose opinions about them were not worth a brass farthing. As the political season heats up, it’s time for me to just keep quiet and smile. On my blog I will just poke fun, criticize and praise everyone because I don’t back anyone. To make things clear, I will state my position as the season gets underway. John McCain is a great hero but he is my age and heaven forbid me being president. I have a hard time finding my way to the bathroom. If McCain were younger perhaps he could be another Theodore Roosevelt and the kind of President America needs, to be unafraid of big business and to walk softly and carry a big stick. Sarah Palin is terrific and a pit bull. She is a maverick but it would be like throwing a lone piranha into a sea of sharks. She also might push a nuclear missile button when she begins to have hot flashes. Obama is an articulate, arrogant self-serving guy who only wants to be President because of self and race and lead us into Armageddon as he surrenders America to the Middle East and makes us a welfare state. Biden is only full of words and short on deeds. His transplanted hair has penetrated the skull into his cerebral cortex and unleashed his tongue with meaningless rhetoric. All of these people bad-mouth each other and make it sound as if the other is un-American and out to destroy the country. I know they want to get elected but I hate that confrontational approach to solving our problems with the economy, energy and making peace in the world. There is no one for me. Why am I so indifferent about the Presidential election? It probably doesn’t matter who is elected because little can be done about the demise of Western civilization. All we can do as Democrats and Republicans is blame each other for what is happening on the world stage. As the Middle East and China emerge, we along with our European neighbors are declining. Russia will probably ally with Iran. All this is to fulfill prophecies in which we will only play a minor role because we are to be a minor player as a world power. It may not matter how we achieve minor significance. McCain will get us there by slaughter of our population and Obama by surrender. My guess is that Obama will be elected because he fits better into the plan of demise as I see it. That’s enough of politics. As for as religion, I will continue to go to church and listen to the repetitive verses of praise music and poorly organized sermons and then do most of my worshiping on the porch. It does little good for me to try and convert anyone in religion or politics because their mind is already made up. Their opinion is right because they made it themselves based on second-hand opinions from those they have deemed to be authorities even though these opinions are not worth a brass farthing. 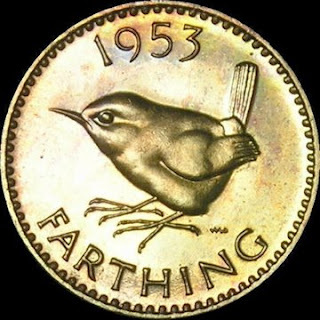 A brass farthing is a coin worth nothing. I guess I am on the bandwagon with you, Doc. I don't really have much confidence either way. Whichever team wins and goes into Washington with their "change" banners will walk into the Capitol met by the masses at the front door, be led through the rotunda directly to the back door and be told that they can put their "changes" in the nearest dumpster. The only way this country will ever see change is when we have term limits and I have read and re-read Revelation and term limits is not mentioned.